Invoiced lets you display instructions to your clients on your invoices for offline payment methods you accept, like check and wire transfer. Customers can even notify you through the customer portal when the check is in the mail. When a payment is received outside of Invoiced, we give you tools to apply those incoming payments to outstanding invoices. Setting up offline payments is easy! Follow these steps to display your custom payment instructions to customers. Click Setup on the Payment Instructions payment method. 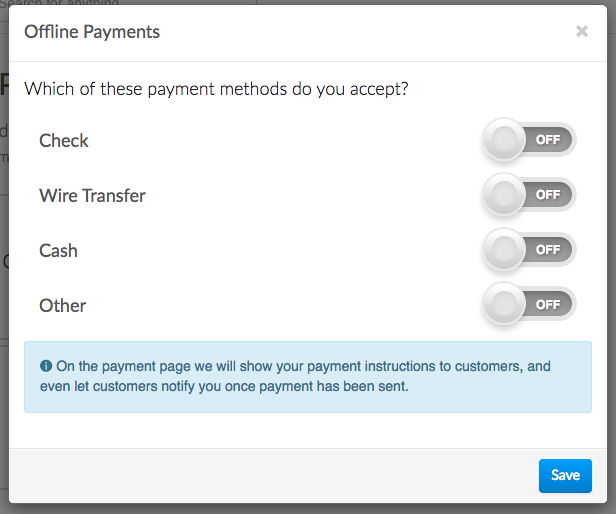 Click on the toggle for each payment method you want to accept, like Check or Wire Transfer. Then enter in your payment instructions for that payment method. Click Save to enable offline payments. When your client selects any of your offline payment methods we will show them your custom payment instructions. They can even notify you when the check is in the mail. Once you receive the payment you will need to record the payment through the dashboard in order to mark the invoice as paid. 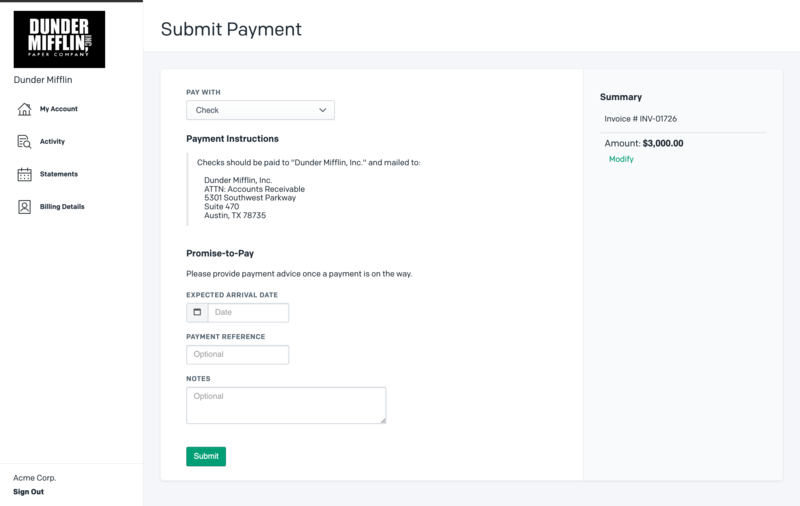 You can do this by accessing the Invoice and proceeding to the Payments section, clicking Receive Payment, fill in the form, and finally click Create. Cash Receipt: The record when a cash payment has been allocated for the sale of a product. This can be cash, check, wire transfer, etc. Charge: Credit Card & ACH transactions. Voilà, the invoice is now marked as paid. Want to pay multiple invoices for a customer? Access the customer’s profile and press the addition icon in the top right corner of the page. Choose Receive Payment. Here, you will select the payment type, and the amount you wish to apply. Then, you will be able to select the outstanding invoices for the customer. Whenever customers pay electronically Invoiced will always ensure the payment is for the correct amount. However, if you accept offline payments, like checks or wire transfers, it is possible that customers will overpay. We've tried to make handling overpayments as easy as possible. When you record a payment through the dashboard and there is money left over after applying the amount to any outstanding invoices then we will give you a choice to credit or refund the overpayment amount. Should you choose to refund the overpayment then we will record a refund on Invoiced, however, actually sending those funds back to your customer will be left up to you since the original payment was not processed through Invoiced.